The return of everything involving soup and a crockpot, guys. In other words…laziness is in full effect today. Croutons on top are totally optional, but at the same time…not really optional. I gotta have croutons on top of my creamy smooth soups at ALL times, just in case you’re wondering. And really, I’m not even gonna judge you if you just slurp this soup straight from the crockpot. 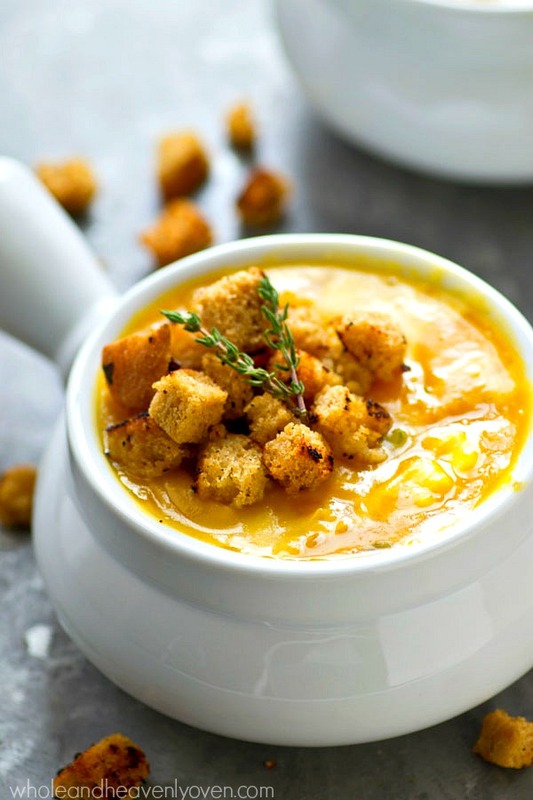 Unbelievably smooth, creamy, and flavorful, this comforting butternut squash soup makes itself completely in the crockpot and you'll never believe it's only 110 calories per bowl! In a 4-qt crockpot, combine squash, onion, garlic, celery, salt, pepper, and nutmeg. Pour chicken broth over top. Cover crockpot and cook on low heat 5-6 hours or on high heat 3-4 hours until squash is very tender. Working in batches, puree butternut squash mixture in a high-speed blender until completely. Return to crockpot and stir in cream and fresh thyme. Season salt with additional salt and pepper to taste and cook an additional 45-60 minutes on high heat. Serve soup warm and enjoy! 0 Response to "CROCKPOT ROASTED GARLIC BUTTERNUT SQUASH SOUP"